Rooms cancelled more than 14 days prior to scheduled arrival will receive a complete refund. Rooms cancelled less than 14 days prior to scheduled arrival will be charged the full amount of the deposit. If you have booked your reservation through a Third party, you must cancel your reservation through that Third party. Late Arrivals. The front desk is open from 3 PM until 6 PM. We can easily accommodate late arrivals, please contact us in advance to make arrangements. Extra fees will apply for a late check out. Booking Deposit. We will charge your credit card for the first night's rent and applicable taxes as a booking deposit on receipt of your booking. Two People per Room. Most of our rooms accommodate only two people in a queen or king size bed. We do not permit additional occupants in these rooms. If you are travelling with 3 people, be certain that you have reserved the Blacktail Deer, Hummingbird, Treehouse or Woodpecker. The Gray Squirrel can accommodate 4 people. The price shown above does not include the $25 per person charge for additional persons in a room. Children. We strive to provide a quiet and relaxing atmosphere at the Inn, therefore we typically do not allow children under the age of 12. If you are traveling with children, please contact us as we can sometimes accommodate children in rooms that will not disturb other guests. If children under 12, are approved by management then a $25 per child charge will be added to the booking. Pets. If you are traveling with your pet, please be sure that you have reserved a pet friendly room. We only allow pets in the Blacktail Deer, the Acorn Cottage and the Jack Rabbit. The price shown above may not include all appropriate pet fees, which are $25 per pet per night. Non-smoking. For the health and safety of our guests, the Inn is a non-smoking property. Smoking is not permitted anywhere inside The Inn or in any outside areas, including the patios, gardens, etc. Guests who wish to smoke must do so off-property. Smoking inside The Inn will result in an additional cleaning fee of $250. Breakfast. A three course breakfast is included with all stays. Breakfast is served between 7 AM and 9 AM, in the dining room, on the deck or delivered to your room. Should you require a gluten free, vegetarian or vegan entree, please contact us in advance. Social Hour. Between 4:30 and 5:30 every day we offer guests a complimentary glass of wine or beer and light snacks in the living room and out on the deck. Parking. There is no charge for parking. We do have some additional parking available for vehicles with trailers. If you plan to bring a trailer, please let us know so we can reserve space for you. Directions We are located 16 miles north of Redding, directly off of I-5. Take exit #695, Shasta Caverns and O'Brien, and go west. We are a few hundred feet from the Interstate. There is a sign at the entrance. Some navigation systems and maps are not accurate. Located within the Shasta Trinity National Forest, right off of f I-5 between Redding and Mt. Shasta in the heart of California’s Shasta Lake region. We invite you to indulge yourself. Unwind and reconnect by the fireplace or on the deck. Soothe yourself in a spa tub. Take refuge on your private outdoor patio, or just watch the butterflies and hummingbirds in the gardens. The water activities on Shasta Lake are just right around the corner. Take an evening dinner cruise, hike in the forest, or explore nearby caves. Take a short drive and experience the beauty of Lassen Volcanic National Park or the spectacular Burney Falls.. There’s plenty to see and do. 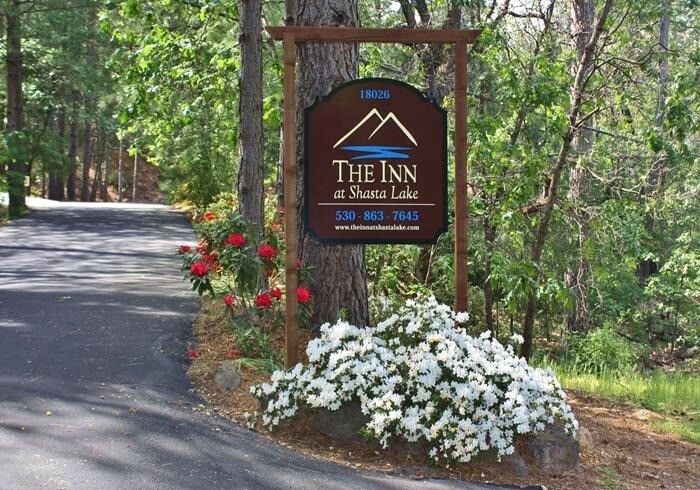 Whether you are looking for relaxation, intimacy, fun or exploration, you’ll find it all at The Inn at Shasta Lake. Our accommodations are elegant, yet casual, luxurious, but still cozy. Our Inn is your getaway. We look forward to taking care of you.